James Tylor and Danièle Hromek’s works reflect the erasure of Aboriginal people, culture and knowledge through colonisation. Tylor’s works visually represent this removal and censorship as a void in the Australian landscape whereas Hromek investigates how Aboriginal people now occupy, sense, Dream and contest postcolonial spaces, particularly on Country that has now been built over and developed. Their artworks remind the viewer of the void that exists in Australian architectural and settler history and signal that although spaces may seem neutral, they are steeped with memory and a troubled history. Danièle Hromek, Untitled (Eisenmann by hand, speculative design), 2013, pencil on vellum, lightbox, 125x120x440cm, courtesy the artist. James Tylor, (Deleted scenes) From an untouched landscape #7, 2013. East Coast of Tasmania, Palawa land. Inkjet print on hahnemuhle paper with hole removed to a black velvet void, 60 x 60cm (framed). Courtesy the artist and UTS Art Collection. ‘Void’ is a subjective word that can have multiple, and often opposite, meanings informed by personal and cultural perspectives. For example, in the artworks in this exhibition, void has connotations of presence or absence; infinite or enclosed; defined and undefined. On a post-its or palm cards, write down all the words you can think of that you associate with the term ‘void’. Write one word per card. Lay them out on a surface. What feeling does each of these groups of words create for ‘void’? Do you feel that any of these groups don’t fit? Why? Now, pair together any words that oppose each other. Do both words still fit the term void? Why or why not? Choose the 3 words that you feel best represent ‘void’. Compare these with a friend. How does their interpretation of void differ? What informs each of your interpretations? Look closely at Tylor’s photographs. What words from your ‘Getting Started’ do you feel best fit Tylor’s representation of the void in his photographs. Why do you think this? 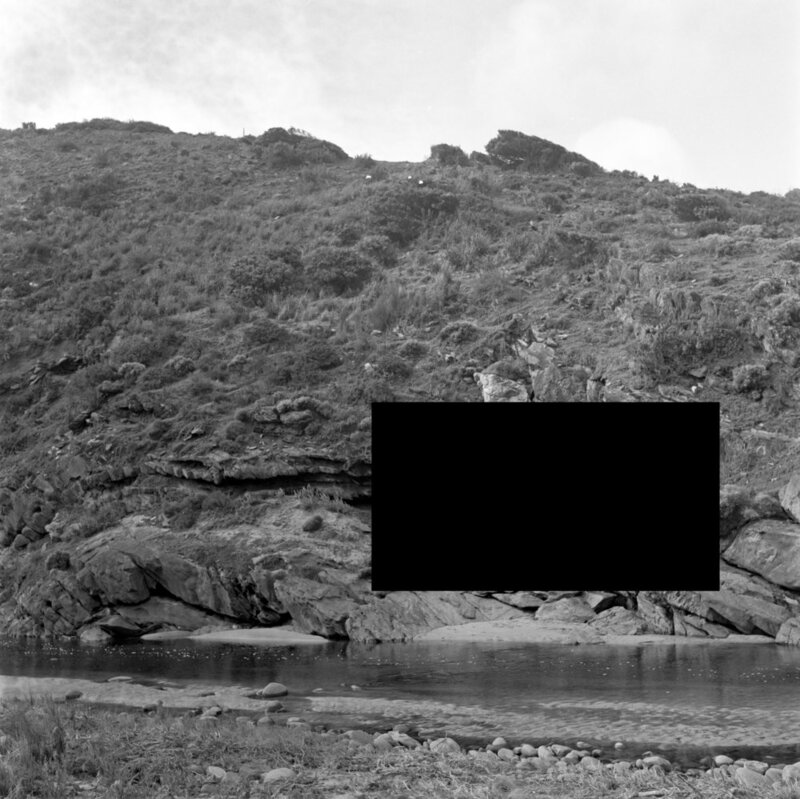 In making these works, Tylor cuts a hole out of the photograph and places a black velvet void behind the image. How does this process reflect the meaning of void that is explored in ‘Erased Scenes from an Untouched Landscape’? Describe the interaction, or relationship, between the ‘void’ and the rest of the image in Tylor’s photographs. Consider the shape, placement and material of the ‘void’. Landscape is one of the key genres in Western art, and can be defined as art that mainly depicts a scenic view. How do you think Tylor’s photographic works challenge this definition of the landscape genre? Look closely at Hromek’s drawings. What words from your ‘Getting Started’ do you feel best fit Hromek’s representation of the void in her drawings? Hromek’s works are “speculative” drawings of what she imagines the inside of deconstructivist American architect Peter Eisenmann’s prototype houses to be like. - From her drawings what do you imagine this space to be like? - How might we behave in this space and why? Hromek describes her work as exploring ‘urban emptiness’. How can you see this idea reflected in her work? Think about the shapes, lines, voids and presentation of her work. In the essay for this exhibition, Hromek is described as “making room for her own Indigenous understandings of space within architectural history”. How is this concept reflected in the process of Hromek’s work? Everybody’s life has an accompanying geography, which is mapped onto the landscape. Bruce Pascoe says in his introduction to this exhibition, “we share this country now.” By focusing on individual life stories, or our autobiographical memories, we are able to build shared understanding of place and what it means to different people in our community. In a group, follow the steps below to create a communal geo-biography of place. Choose a place that everyone in your group has an experience of: perhaps your school, the suburb your school is located in or even a region of the city where you live. Take a photo of a specific site within this place that you associate a strong memory with. For example, where you sit at lunch at school, or, the beach you always visit with your family. - share at least one fact about the history, geography or community of this site. This should include Aboriginal history and knowledge. - explain your memory of this site. As a group, plot each of your geo-biographical sites onto a map or aerial photograph of the area. Exhibit the map together with each of your group’s photographic geo-biographies. Consider: how do our experiences of place differ? How do they combine to represent a fuller understanding of place? Note: You could also complete this activity by using different mediums such short film, audio-recordings or illustrations instead of photography. Be creative with the presentation of your geo-biographies! You could layer your text over the photographs or design them as posters. Watch Bruce Pascoe’s Ted talk, A real history of Aboriginal Australians, the first agriculturalists. Use the AITSIS Map of Indigenous Australia to find out the language or nation group of the land where you live. Research the environmental practices that they would have used to manage the land before colonisation. What can we learn and apply from these approaches today? Research Danièle Hromek’s work as well as contemporary Aboriginal artists, architects and designers who work to ‘decolonise’ public space, including architect Kevin O’Brien and artist Daniel Boyd. What do these spaces, or projects have in common? What do you think it means to decolonise place or space? Why do you think is this important? How can we all, Indigenous and non-Indigenous, contribute to decolonised spaces in our community? EXTENSION: Read Danièle Hromek’s piece on yarning circles and research ‘democratic classroom discussions’. What are the differences in these ways of communicating and sharing ideas? What are the similarities? Hold a Yarning Circle as a group using Daniele Hromek’s description (see ‘creating culturally safe spaces’ in further research). Consider how you will set up your space and ways of starting and ending the discussion.